Here is a fun behind-the-scenes photo we took while shooting the trailer. It was only fitting that my son be a part of it (even if he doesn't actually appear in the trailer). Sounds crazy! Well, that's exactly what I did. As I mentioned in my last blog, I've been inspired to write a historical thriller fiction based on true events. 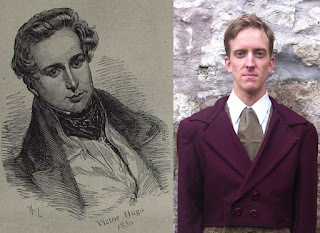 The protagonist of my story is a young writer named Victor Hugo. I spent the summer researching his life, the events taking place in Paris, and the political climate of France at the time. Originally I was going to set the novel in 1830, but my notes and outlines were getting too full of key players (characters) who needed to be in the story. It concerned me became the one common criticism I received from reviewers of my debut novel, Depth of Deception, was that there were too many characters at the beginning of the book (though it seemed to work out as the story unfolded for them). I try to listen and learn from the feedback of readers. As I continued to research, I noticed that I had jotted "Flashback to 1827" several times in my outline notes. 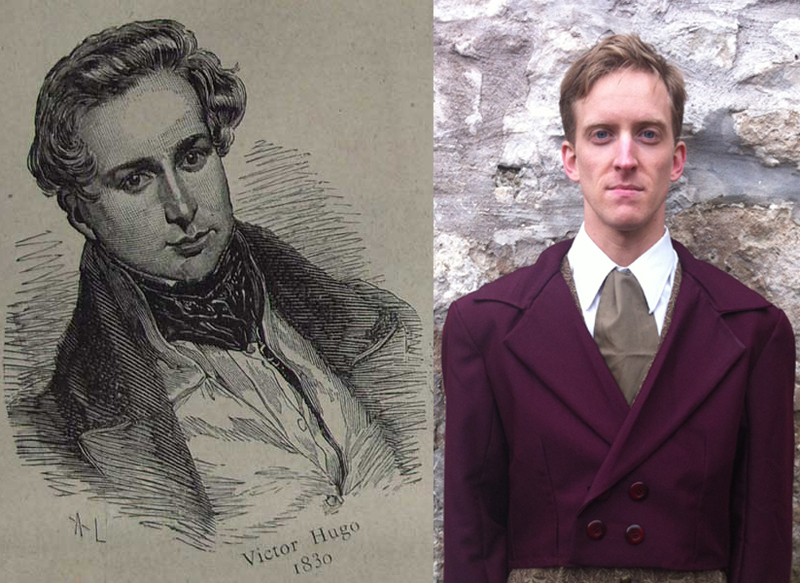 So I took some time to focus my attention on 1827 and realized that there was enough there to create a trilogy. The story would start in 1827, and then Book II would take place in 1830, and Book III would be set in 1832. By doing this, certain characters would already be established by the time we introduce the new players. After four months of researching and creating a very clear outline of the characters, stories and events, I needed to motivate myself to start writing. It was about this time that a few fellow writers were communicating on Facebook about NaNoWriMo (National Novel Writing Month) taking place from November 1 to November 30th. For this, writers challenge themselves to write a 50,000 word novel in 30 days. As I've mentioned before, Depth of Deception evolved from a draft that I wrote for the 3-Day Novel Contest. So why not try this again? So if I succeed, I'll have a first draft completed by November 30. Then I would deconstruct, edit and polish that into a second draft. It will be winter by the time it's complete. I had images in my mind for a book trailer that I would create from scratch, but winter would be inappropriate for my story and too cold to film in the location I wanted. So I did something crazy: I gathered my resources and with the help of some friends, shot some still photos of some of the scenes in my mind that I know will not change drastically. Since I haven't written any dialogue, I didn't want to have any actor saying something that won't be in the book. So using stills would solve that problem and I would photoshop and edit in the style of my short film: First Light (see blog). Here are some sneak-peak pictures from our photo shoot. Check back November 1, when I'll be starting to post updates and links to the chapters as they are being written. 'LUTETIA: Darkness Beneath the City of Light' (set in 1827). Inspiration hits when you least expect it and sometimes from the most unlikely sources. My next novel was inspired by my 2-year old son. After writing the first ten chapters of Bloody Mary Kelly, (I previewed the first two chapters at the end of Depth of Deception) I was hit with writer's block as I mentioned in an earlier blog. While I was dealing with this dilemma, my 2-year old son was watching Les Misérables in Concert. He has watched it many, many times. "Sings" along with Jean Valjean and Gavroche and seems to have a crush on Éponine (or "Ep-Pony" as he calls her). I can't complain about him enjoying it. There are shows geared for his age-range that drive me crazy. So him liking a classic story told through music is fine with me. It should come as no surprise that I've always loved the classic tales of that era. I've read and loved the swashbuckling works of Alexandre Dumas, epic novels of Victor Hugo and loved Baroness Orczy's Scarlet Pimpernel. Years ago, I had started writing a screenplay based on a historical figure from that era but I had a difficult time condensing his extraordinary life story into a 120-page script. Trimming down the richness and the complexity seemed to cheapen and reduce it to a mere documentary. I needed an angle but I had none that would do him justice so I shelved the idea and went to work on other writing projects. Fast-forward in time to me struggling with writer's block. I laid down for a nap while my son was watching Les Misérables in Concert - again. As I started to drift to sleep a lyric got stuck in my head... something wasn't right with it. I'm not sure how long my wife had let me sleep, but when I woke up, that lyric was still in my head and it sparked something. I got up, grabbed my iPhone and cross referenced with a historical event. I grabbed my copy of Victor Hugo's novel Les Misérables and found the angle that I had been looking for when I had tried writing that screenplay so many years ago. It became clear that a screenplay format would not suffice as the ending of the story popped into my mind and for the next few months I researched that era of France for the details that will go into my next novel. It has been invigorating and exciting and would never have happened had my son not been watching Les Misérables in Concert again and again. So this novel is dedicated to my son. Now to start writing it... starting November 1st, as I've registered for NaNoWriMo. My 2-year old son watching Les Misérables in Concert. One thing many writers struggle with is too much exposition. I can be guilty of doing so, especially while writing a screenplay where, in order to get subtext or background details out, it easily translates to too much tedious dialogue. Many years ago (in the early 90's) when I took a screenwriting course at the University of Toronto, I was given an interesting exercise to address this issue. Our teacher challenged us to write several scenes or a short film without using any dialogue. None. Zero words spoken. Everything had to been 'seen' not 'said'. Surprisingly, I enjoyed this challenge. So for my assignment I wrote a vampire love story that took place over the course of 900 years. It was a lot of fun to write and I was able to weave my love for historical settings throughout. I received an excellent mark for it and my instructor wrote, "I can visualize the whole thing as you wrote it. Hope you get to put it on screen some day." That comment inspired me to make it into a short film. The problem was that it would be a costly film to make, with all the exterior locations and the various time periods. So I tried applying for grants and getting some funding for it, but anyone reading the script said the same thing: "Great script but it's too expensive to shoot. It can't be made." I then gave up any hope of making my short film, until a couple of years later when I purchased my first digital still camera (Kodak DC290). Digital photography was still in its infancy but I loved the joys of not having to be limited to 36 pictures per roll and previewing and deleting right away. One fine day I was at a Renaissance festival, taking many pictures, when a talented singer named Heather Dale appeared on a nearby stage singing olde fashioned songs. The combination of her music with the images I had just taken hit me with inspiration. I would make my short film with just stills and music. It had been done in the 60's with a French film called "Le Jette" but I wouldn't be limited by cost of photo development and could do a 20 minute film without repeating a picture. This camera had great manual exposure control for night time shoots and I could use Photoshop to recreate the past. So over the next two years I shot over 3000 still photos throughout the streets of downtown Toronto and various other locations. My friend Kirk Teeple composed the music for it to help tell the story and brought in a colleague to do vocals (still no words) and add medieval instruments. Ironically, that colleague was Heather Dale, who, unbeknownst to her, two years earlier helped to inspire the idea. When completed it was entitled "First Light" and it screened in festivals all over the world. Won some awards, too. Not too bad for a film that I was told couldn't be made. It is exactly 10 years since I completed "First Light" and since it's no longer doing the festival circuit I've posted it on YouTube for everyone to enjoy. Here it is: a 900-year-old love story told entirely with still photos and no dialogue or narration.